Risk Return and Investment - Where to Invest Money in India? Home » Investment » Risk Return and Investment – Where to Invest Money in India? Risk Return and Investment – Where to Invest Money in India? Where to invest money in India? It is one of the frequently asked questions by Indian Investors. The answer to this question is highly dependent upon risk-return and financial goals of the Individual. The answer could be equity, gold, real estate or perhaps fixed deposit. Whatever is your choice one thing is sure that risk and return plays a vital role in the selection of investment. In this post, we will talk about risk and return in various investment avenues of 2018. As equity, real estate, gold, and fixed deposits are most popular investment options we will limit our discussion with these investment options. Equity – High Risk, High Return Investment Option. Real Estate – High Risk, Moderate Return Investment Option. Gold – Moderate Risk, Moderate Return Investment Option. Fixed Deposit – Low Risk, Low Return Investment Option. A first thing that comes to investors mind while talking about equity is a risk. A risk is the probability of permanent loss of capital. If a risk is reduced or eliminated equity will become the first choice for the investors. For understanding let’s assume that perception of risk will depend on the periodic declines in the equity market that investors have witnessed recently. If market declines are more investor will become cautious. On the other hand, if market declines are less investor will be ready to invest more money in the market. Let’s take a look at the interesting chart which shows the intra-day declines witnessed by Nifty in last 28 years. From above chart, one interesting thing is coming out. 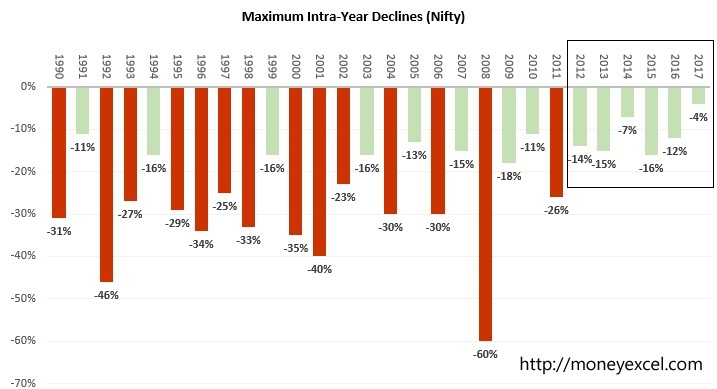 In last 20 years’ time frame from 1991 to 2011 nifty has witnessed substantial declines every year. Around 15% decline was quite common. However, in last 5-6 years, these declines have been reduced significantly. Another way of evaluating market condition is volatility index. India VIX is India’s Volatility Index which is a key measure of market expectations of near-term volatility conveyed by NIFTY stock index option prices. If you look at a recent chart of India VIX it clearly shows that fluctuation in Indian equity market is extremely low. After checking risk part let’s take a look at return part. 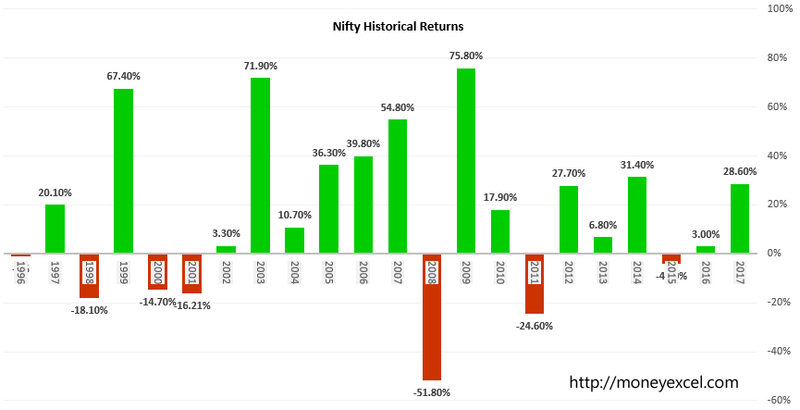 Here is a chart showing Nifty Historical returns since 1996. From below chart, we can see that in last 5-6 years nifty had generated a very good return. Last year return was extremely good. Now let’s compare equity with real estate gold and fixed deposit. After demonetization, there is a significant reduction of black money in the market. This has created an adverse impact on the real estate. Real estate returns are extremely poor in recent times. At most of the location, we have observed a decline in property rates. In order to prove this argument let’s look at the interesting chart of NHB Residex. From the chart, it is evident that at multiple locations QoQ Decrease in Price of real estate is observed. A performance of Gold a yellow shining metal is not so good in the recent past. 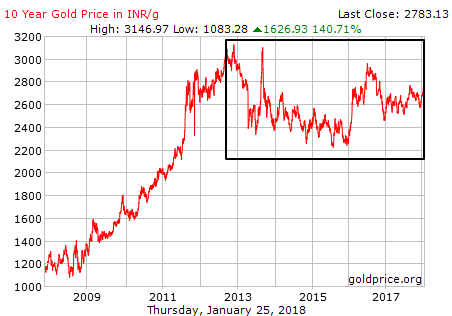 From last few years, the gold price is declining. 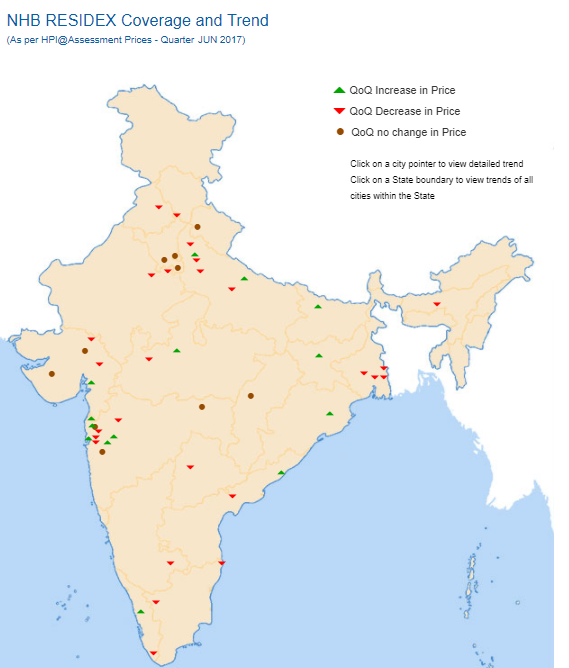 The chart is given below to indicate gold price variations in recent past. Bank fixed deposit rates are reducing. This makes gold and fixed deposit less lucrative option for the investment. From above discussion, we can conclude that risk is reduced in equity investment and returns are still high. The second conclusion is other investment avenues are not performing up to mark. Where to Invest Money in India? Based on above argument we can say that equity has become lucrative investment option and one should invest money in the equity market. This is what exactly happening nowadays. Investors prospective towards risk in the equity market has changed. Investors are pumping money in the equity market and mutual funds. The current rally in the stock market is mainly due to investor behaviour to take more risk. Money inflow in the mutual funds is at peak. Mutual funds are investing this money in the equity market. According to data available at AMFI, 1 Lakh Cr is invested in Mutual funds in the year 2017. This amount is nearly double compared to last year. 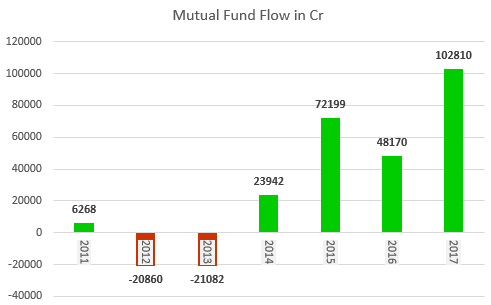 The chart is given below to indicate that mutual fund investments are growing. Small Cap and Mid Cap mutual funds have generated extraordinary returns in the recent past. SBI Small Cap Mid Cap fund had generated 80% returns for the investors. Fund house have restricted their funds for new money. Apart from SBI Small Cap Mid Cap fund other funds like DSP BlackRock Micro Cap Fund, Reliance Small Cap, Mirae Asset Emerging Bluechip have also restricted inflow of money. The only reason is they are unable to manage money. Inflow is growing at such as extent that Portfolio Management Service Providers have shut down their funds and returned their money back to investors. ICICI Pru is one such PMS. From above discussion, it is clearly coming out that investors have accepted equity as the best investment option. They are investing their money in equity. However, one should remain cautious and focus on the risk while investing in the equity market. Mid Cap and Small Cap segment is another area of concern where valuation of stocks and risk are high. One should stick to a financial plan and avoid taking unnecessary risk in the equity market. Tags: gold historical return, nifty historical return, nifty risk analysis, real estate return, risk, risk return, Where to Invest Money in India?